I had a rather bountiful couple of trips to the flea market this past weekend. By the way, if any of you live in Ohio, it's worth a trip to this particular market. I'm spoiled because it's just minutes from where I grew up and I guess I take it for granted. It's called the Hartville Flea Market in Hartville, Ohio. I am never disappointed in the selection of vintage goods. Don't these creamy things looks beautiful all scattered willy nilly? Love that look. I could just scatter things around the house on tables this way and be happy. As long as they are pretty things. 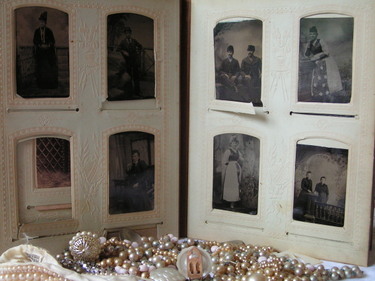 Found this old photograph album that is just filled with tintype photos and also cabinet cards. A treasure for sure. 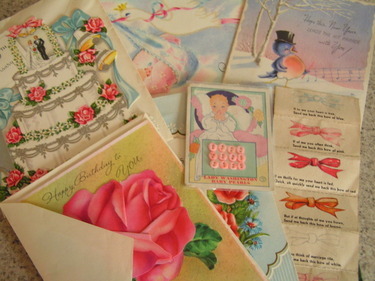 Some old greeting cards and notions below. I love the graphics on old greeting cards and plan to have the baby's birth announcements done with a similar vintage feel. I made Mario's birth announcements myself, but I'll definitely be ordering them this time around. 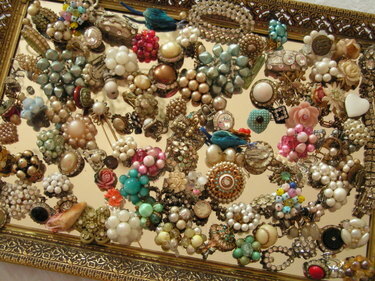 Then, there's this big ole' tray of old costume jewelry. 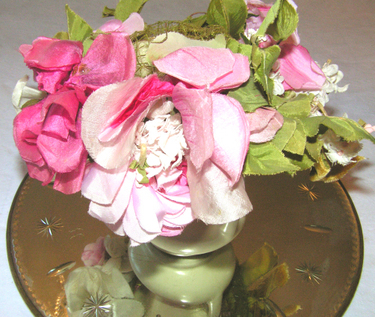 I use lots of these pieces in my creations and am fond of the fact that they are pretty much one of a kind pieces. Unique and special. These ballet slippers are my favorite purchase. Love them. 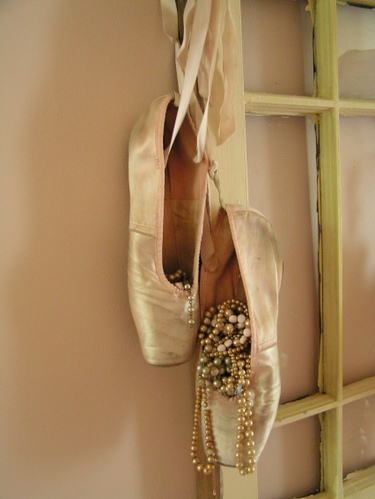 I talked with the vendor a while and he told me that they belonged to an old girlfriend who was a ballerina with the Cleveland Ballet in the 1940's and 50's. 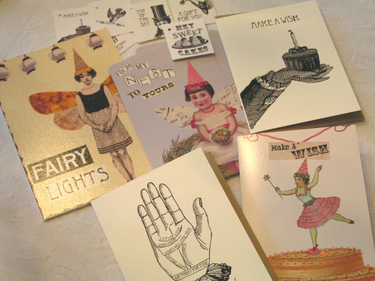 The photo above shows some of her cards that I ordered and love. It will be hard to part with them. 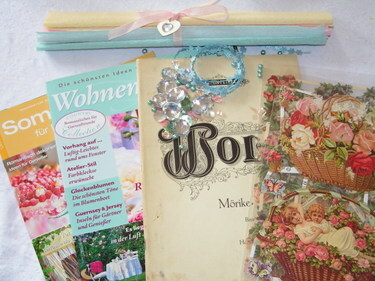 This lovely parcel came all the way from Germany, from Carol. 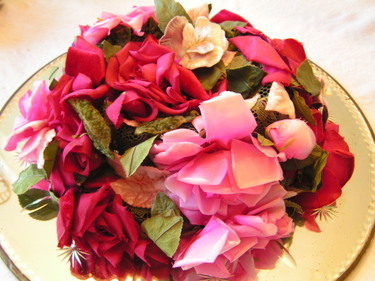 I love the florist's crepe paper she sent. Reminds me of what they used in Sarajevo to wrap around bundles of flowers from the market or the florist. It must be a European thing, but I think someone needs to import this stuff! The German scrap sheets are beautiful. I'll be saving those for something special. She also sent some German craft and decorating/gardening magazines which I saved for the ride to Ohio last week so I had something new to read. They are filled with creative ideas and inspiring pictures. Just wish I could read German! I love foreign magazines, love the slightly different twist they put on home decor and crafts. I promised pictures of my flea markets treasures. I'll get to it today or tomorrow, I really will. There's quite a bit to photograph, and it's currently piled up on my kitchen table. Hello Dear Readers. Sorry for my absence. We were in Ohio visiting family and throwing a baby shower for my sister-in-law! She's due in August, and is having the first girl grandchild for my parents. There are already 3 grandsons......soon to be four! 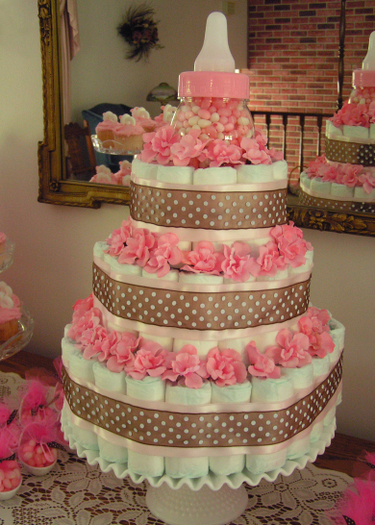 Of course, it was lots of fun to put this shower together because we were decorating with pink. I took some pictures before everything was completely set up, but I think you can still get the idea. 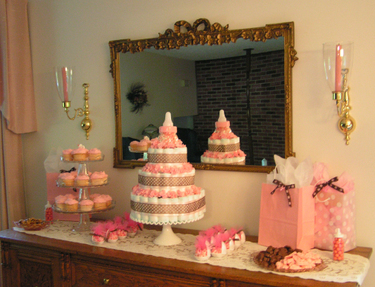 The top photo is the buffet at my mom's house before we added the final little details. 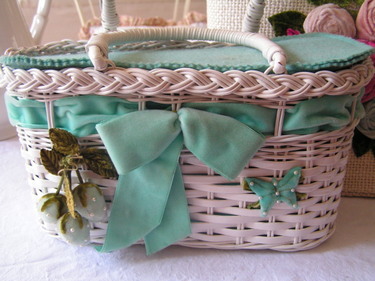 I made the diaper cake, and my mom and I assembled the little bassinet favors. 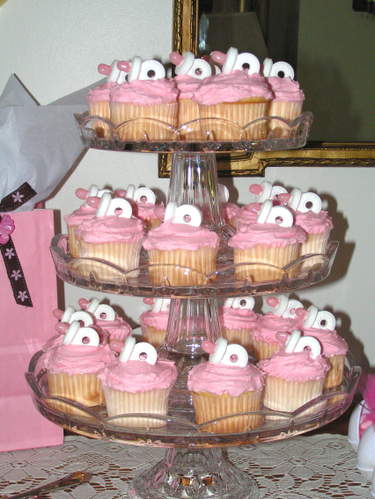 We made these little cupcake toppers by simply "gluing" together two mint LifeSavers with royal icing. Then added the mini jellybean with the icing as well. I think they turned out so cute. 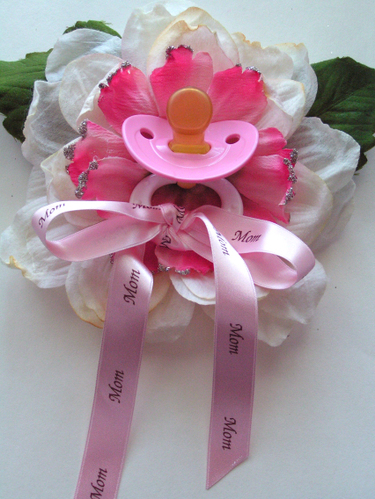 I thought Amy needed a corsage so I put this one together the night before we left for Ohio. 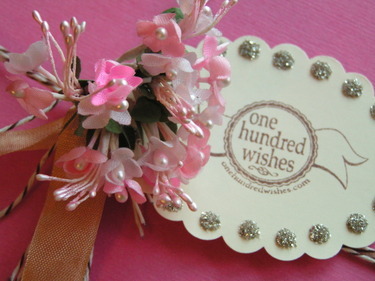 I had seen the idea at a friend's shower a couple of years ago and loved it. Here's the back. It was a mess of hot glue and needed to be covered up! It was a lot of fun and Amy received so many nice gifts. All she needs now is the baby! I finally finished a custom order I've been working on and thought I'd share a few peeks. 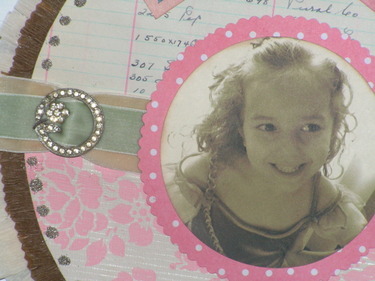 The customer wanted a round hanging piece with her adorable daughter's photo. 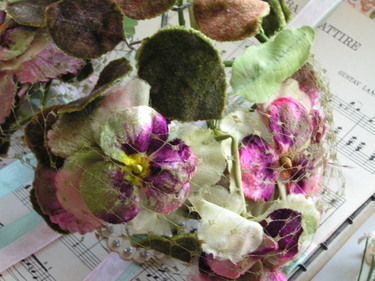 It's very similar to the one I made of George and I on our wedding day. 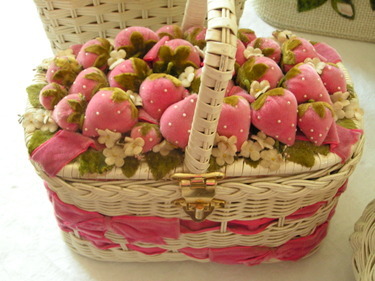 She also ordered some cakes and hats and a basket full of other goodies. She asked me to create several items but with very few guidelines. 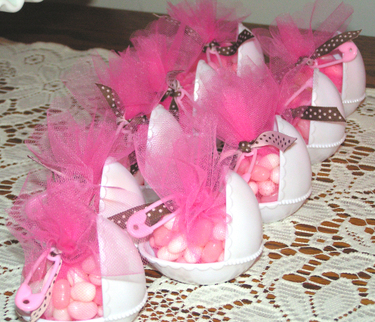 She said she loves pink and her daughter is a dancer so that was easy! These babies are shipping out today, and then I'll take a break from custom orders and swaps and all that good stuff until I get the website finished. I'm still hopeful for the beginning of July, but I'll let you know here first! 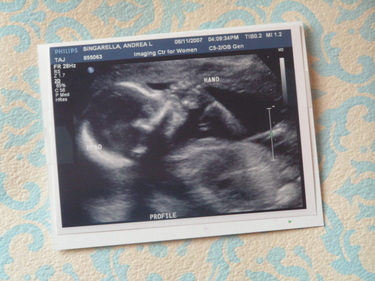 As you probably know if you read this blog somewhat regularly, I'm due to have a baby sometime around the end of October or beginning of November....who knows when.......every ultrasound I have reveals a different due date. 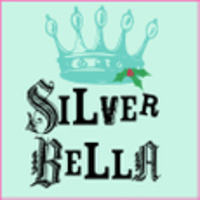 Anyway, that means I definitely won't be able to attend the glitter festival of the year, aka Silver Bella. I so wish I was! Next year for sure I tell ya! However, I've been so excited to let you know that I will have a vendor booth set up at the event. I'll be there in spirit with my vintage inspired wares for sale! A wonderfully kind and generous soul will be working my booth that evening. I owe her big time. I'm so honored to be part of the event. For all of you lucky duck attendees, I'll be thinking of you and wishing I was there covered in glitter as I'm sure you all will be. Have fun girls! I have no will power. None. I was going to wait and be surprised about the baby's gender, but I just couldn't take it anymore. The curiosity was killing me! George was willing to do whatever I wanted so it was really my decision. We had an ultrasound this week and found out that we're having a boy! A brother for Mario. It will be fun to see them together, and I'm happy that they will have each other as little playmates. I never had a sister (I have 3 brothers) so I don't know the feeling of having a sibling of the same gender. I imagine it's a strong bond. I hope it's like that for my boys. I just can't wait to meet this baby! Is there anything more exciting in life? I really don't think there is. Do you see him sucking his thumb up there? So cute. The sonographer measured his feet at just 3 cm long. Amazing. I've been revisting this book, which I used for lots of inspiration when Mario was a baby. Just love this book. Makes me want to pitch a tent at a flea market and buy all sorts of old baby things everyday! 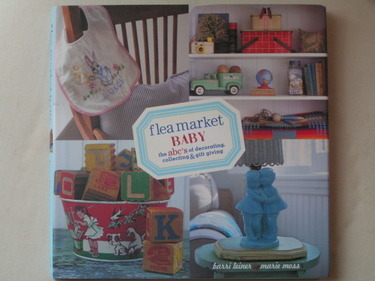 A wonderful decorating book if you've got babies or even small children. Now we just have to think of an Italian name that goes with Singarella......this is the hard part! I don't want it to be too many syllables, or something that kids won't be able to pronounce! We've been thinking about it for a long time and have only a couple names that we're considering. I'm sure it will come to us sooner or later! I cannot believe that I will have a baby in 4 months. I think it just hit me. I must have lost my mind when I decided to start a business AND get pregnant. But I knew if I didn't just do it, I never would. I would feel too overwhelmed to begin a new venture with 2 or 3....or 4 kids so I wanted to start when I had just one little one running around. 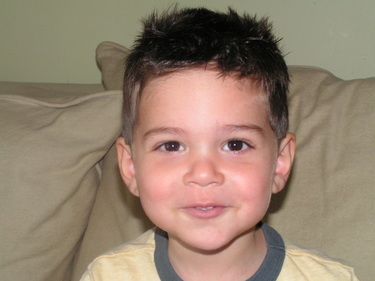 Speaking of that one, here's his new haircut (and a very mischievious smile to go along with it). He must have just finished hiding a few things down the cracks of the couch cushions. Last week I found a bottle of BBQ sauce down there. No leakage, thank goodness. I also discovered yards of ribbons and about a dozen foam paintbrushes. By the way, thank you for all the Blog Love. I cannot tell you how much it means to read all of your comments and congratulatory words. Thank you. Thank you. Thank you. Here's a little surprise I've been keeping to myself for a while now. I wasn't sure when it would happen, but I just got the news! 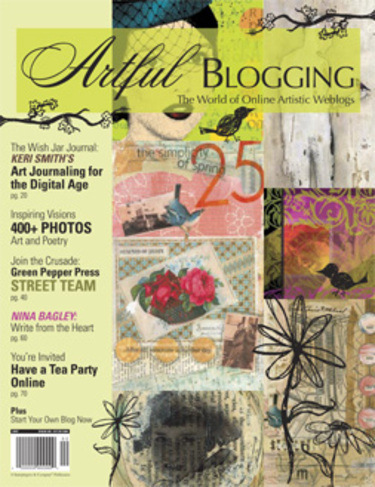 My blog is going to be featured in the new Stampington publication called Artful Blogging. The premiere issue will be on newsstands August 1. I am so excited about this and very honored to be a part of it. Many other artists' blogs will be featured as well. I don't have a complete list, but you can find some names here. It's amazing how blogs have changed things. They have opened many doors and offered endless opportunities. Because of blogging, I have made new friends and found that there are plenty of other people out there who love the same types of things I love. How comforting to know! I have been inspired beyond belief and have pushed myself artistically to be open to challenges and the great unknown. 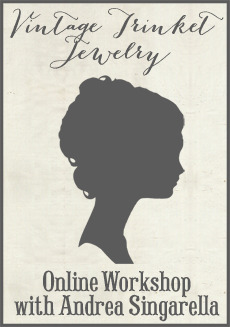 Blogging also put me on the path I needed to start my small business, a lifelong dream I've held so close to my heart. And now there's an entire magazine devoted to blogging! Isn't that amazing? Leave it to the fantastic team at Stampington to create such a publication. I'm sure it will not disappoint! Just wanted to share the news with you all since many of you have been and continue to be such a source of support and inspiration to me. 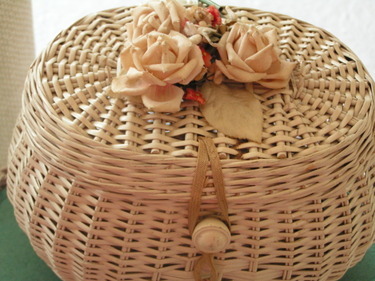 Purses: vintage wicker & velvet yums! 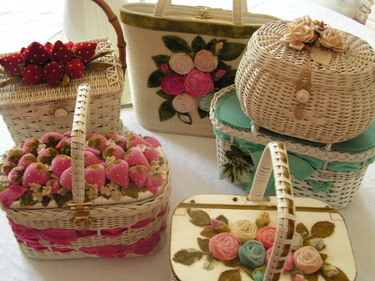 After the last post, I thought I should show you some of my favorite old purses. I always love to see the collections that other women accumulate. I've got a thing for accessories (don't we all? ), but especially vintage ones. 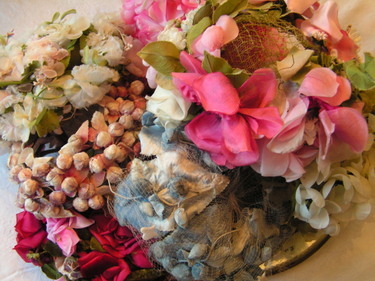 There's an entire drawer in my dresser devoted to vintage head scarves. 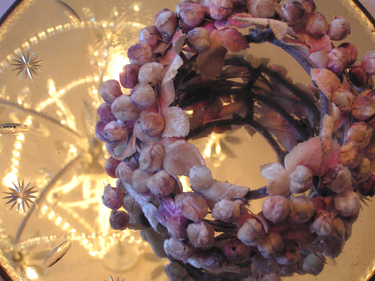 I used to wear them in my hair fairly often, as headbands. Not so much anymore. Maybe I'll have to go digging through that drawer and pull a few out. 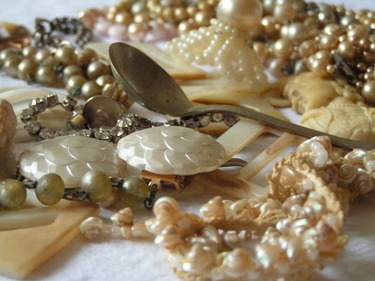 Then there's the box of beaded change purses and old compact mirrors. How much of this stuff do I need, I ask you? Seriously people. Crazy. I've been accumulating these things for years and years. 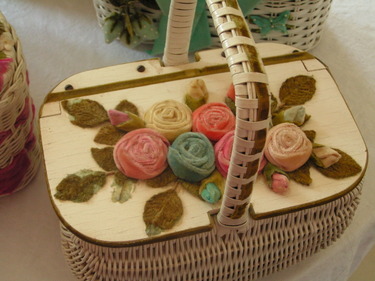 I was the girl in high school with the unusual purses from flea markets, when everyone else had the latest designer bag. I never wanted to see other people with the same clothes and accessories as myself. Even then, I wanted old things. They have a special quality I can't explain. But I'm pretty sure a lot of you get it. So, anyway, here are a few of my favorites from the wicker with velvet strawberries or roses genre. You may recognize this one from my very first post on this blog, back in February. And she's also a part of my banner. This red one is the latest addition. Bought it for a song. It's even got little pearl-filled pea pods nestled in between the strawberries. Then there's this aqua one with just a few dangling berries. But still cute I think. It looks like someone made the top part and added it to the purse. 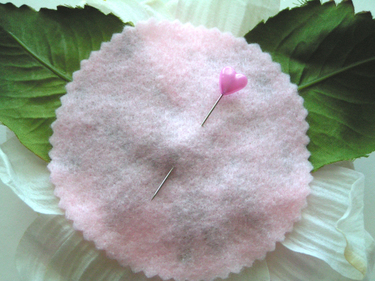 It is probably just cardboard stitched between two layers of aqua felt with a pinked edge. 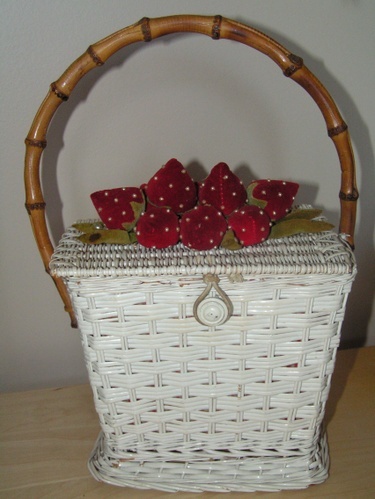 This one is not velvet, but is wicker and has some sweet flowers atop...so I thought it was photo worthy. And then these 2 with the most wonderful color combination I have ever seen. 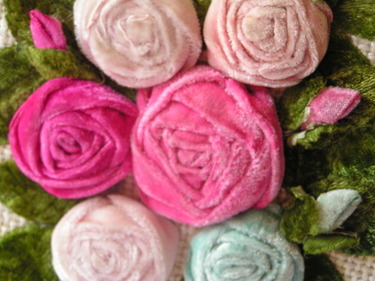 I love how the velvet has been twirled around to make the roses. 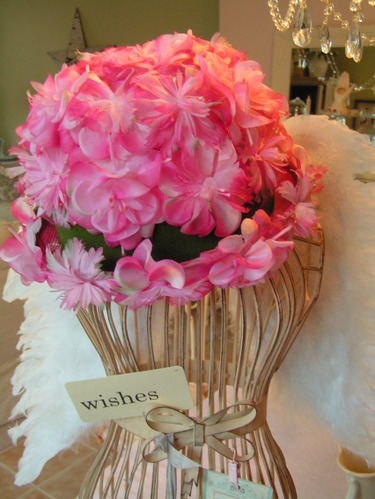 These are sitting on my dresser in the bedroom because I just love to look at them. Our bedroom is sadly neglected and will probably be the last room we redo....one of these days. So, at least I've got some pretty things sitting around to offset the hideous ceiling fan and furniture! So, there you have a little sampling of my favorites..... now don't you all head over to ebay and start bidding on these! Tee-hee. Just kidding. I'm willing to share the velvet love! I'll do another post someday to show you some others......in the meantime, I've got to finish making more goodies for the shop! I was in the grocery store and saw a woman with this bag in her cart. I knew it had to be Amy Butler fabric. 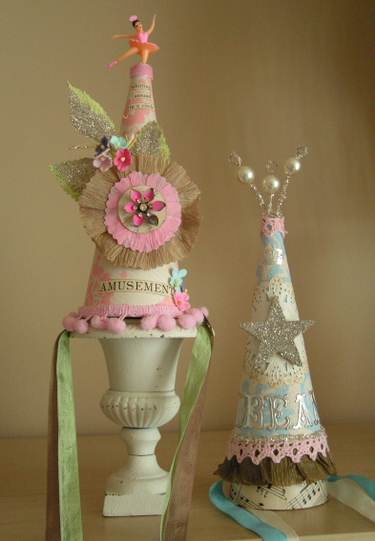 Her fabrics are always distinctive, and I've been loving her new line of scrapbook products by K& Company. Anyway, I stopped and asked her where she got it. After we chatted about the lovely fabric and design, I made a beeline to my local scrapbook store to get one for myself. They were sold out, but I ended up placing an order which I just picked it up yesterday. Ooooh, i love it. 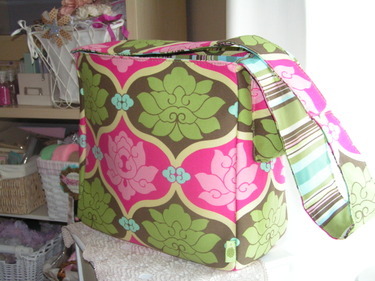 I'm thinkin' it will make a dandy diaper bag, don't ya think? It's called a "Creativity Bag", but I can hardly carry my creative stuff around in a tote! I need something sized more like a U-Haul. I don't travel much for crops and artsy events, but when I do.....yikes! When I went to Art and Soul last year, I looked like a pack mule I had so much crap with me. You just never know what you're going to need. Anyhoo........back to the topic at hand. bags. totes. purses. pocketbooks. call them what you will. I love them. Collect them. Covet them. Always have. I mean, since I was a very little girl. It really is a topic for a whole other post, or series of posts, to be honest. I have hundred of bags. It's a little scary to admit that. I'm a purse person, what can I say? I'm NOT a shoe person. When you wear a size 10 shoe, you are not a shoe person. You go to the store, see a cute little size 6 shoe on display and ask, "may I try this in a size 10 please?" Well, honey, when they bring out the size 10, they looks like a pair of canoes. They lose their appeal. They don't even resemble the dainty little things you were admiring on display. So, you quickly become a purse person. No sizes needed! Hence, the purse love. I like the whole idea of purses. A place to keep your "things", to carry around your necessities, your trinkets (and lollipops and Band-Aids and diapers). All tucked inside safely and waiting to be seen when you open the zipper. There's just something about it. 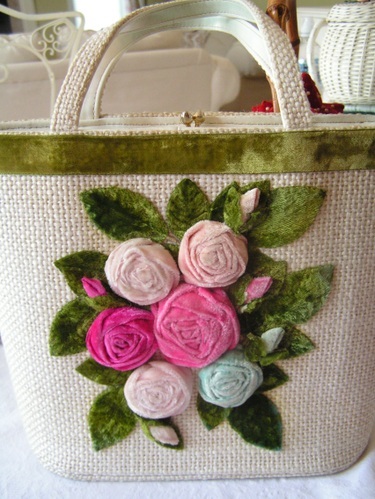 So, this whole rambling post was to show you my new bag and declare my love for it. Aren't you glad you stopped by? I'll do a purse post sometime soon. Vintage ones are my favorite, of course. Are there any other purse collectors out there? Do share!